I arrived back in Dublin from Kraków late last night in time for a busy day today. Early this afternoon [10 November 2016], I am taking part in Commencements at Trinity College Dublin, where former students are being conferred with the MTh degree, including two students whose dissertations I supervised in the last academic year [2015-2016]. Later today, I am in the Royal Irish Academy in Dawson Street, when Dr Peter Harbison is launching a new book to which I have contributed two chapters. 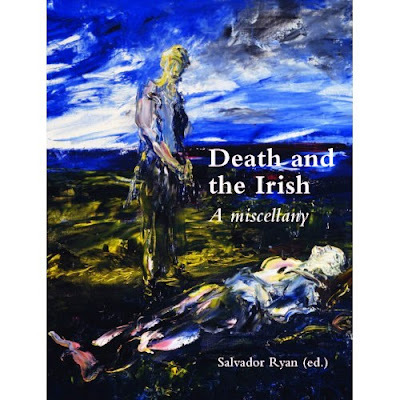 Death and the Irish, A miscellany is edited by my friend and colleague, Dr Salvador Ryan, Professor of Ecclesiastical History in the Faculty of Theology at Saint Patrick's College, Maynooth, and is published this week by Wordwell. My contributions to this new collection tell the story of the Revd Henry Francis Lyte, the former curate of Taghmon, Co Wexford, who wrote the hymn ‘Abide With Me,’ and the stories of two Irish people, JJ Murphy from Cork and Richard Bourke, 6th Earl of Mayo, who died in Italy and in India, and whose bodies had to be shipped back to Ireland in unusual conditions – one in an upright piano for burial in Co Cork and one in a barrel of rum for burial in Co Kildare. I was interviewed in Christ Church Cathedral and Saint Patrick’s Cathedral, Dublin, by Louise Dervin of RTÉ Radio about these stories, and her interview was broadcast last week on both the History Show [30 October 2016] and Playback [5 November 2016]. This new book explores the relationship Irish people have had with death from the earliest times to the present day. In over 70 contributions, stories about death and the Irish are told by historians, archaeologists, folklorists, sociologists, geographers, Celtic Studies scholars, dramatists, anthropologists, musicologists, theologians, liturgists, undertakers and palliative care specialists. This is a wide-ranging and lavishly-illustrated collection, which is both humorous and poignant at one and the same time.